When the Northern Pikes got their start in Saskatoon, Saskatchewan in 1984, the city wasn’t exactly the hotbed of Canadian musical culture. For a group of hungry, young musicians who were hoping to combat hair metal and new wave with a guitar rock sound of their own, theirs was an isolated existence. Luckily, as is often the case in small, rural towns, a fledgling local rock scene emerged in Saskatoon. This gave Potvin and fellow bandmates Jay Semko, Merl Bryck, and Don Schmid––who first met while they were members of various other local acts including The Idols, Doris Daye, and 17 Envelope––the opportunity to develop themselves into a well rounded live act. The only problem was there really wasn’t much work around town for bands that wanted to play their own tunes. In those days, weeklong residencies at local bars were common. Most venues would host a house band Monday through Friday, and the expectation was that they’d play popular songs and do three to four sets a night. “We did countless engagements like that all over Saskatchewan in these small, bizarre, backwater towns like Weyburn and Fort Qu’Appelle. We’d stay in these really, really unattractive places,” says Potvin with a laugh, “but it worked. You’d play four 45s a night, and then at the end of the evening around last call, you’d get to play your three rowdiest tunes. “We’d go out there and play a bunch of songs by the Stones, the Beatles, and the Kinks, and then we’d just blend our own stuff into the mix. Every so often we’d tell the crowd, ‘Hey! Here’s a new one by so-and-so!’ And we’d just make up some fake song title by some fake artist only it would be one of our own. Nobody had a clue. 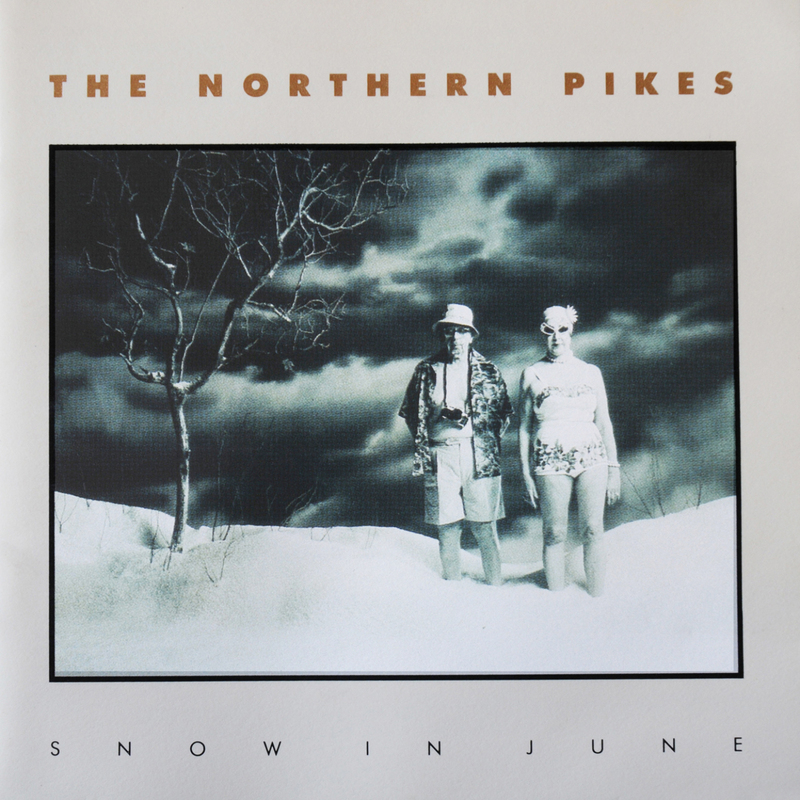 With two EPs of original material––The Northern Pikes (1984) and Scene in North America (1985)––already under their belts, the Pikes decided it was time to get creative about how to bring their music to the outside world, and called up The Library of Congress to ask for a comprehensive list of college radio stations across the U.S.. In addition to the band’s EPs, included in each package was a self-addressed stamped comment card. It wasn’t long before the Pikes caught the attention of Doug Chappell, president of Virgin Records Canada who was intrigued by their multi-singer, multi-songwriter sound and signed the band in 1986. The following year, the Pikes released their major label debut Big Blue Sky, which contained their first significant Canadian hit, “Teenland.” Penned by Pikes’ singer, songwriter, and bassist Jay Semko, the song not only garnered the band critical acclaim, but also opened them up to a whole new facet of the listening public when the video for the song entered heavy rotation on both MuchMusic and MTV. The album produced two additional singles, “Things I Do For Money” and “Dancing at a Dance Club,” and was eventually certified gold in Canada effectively launching the Pikes’ career. What followed was an intense six-year period during which the band released four hit albums, upward of a dozen singles, and opened for acts like Duran Duran, David Bowie, and the Fixx. “You know, I’ve been telling this story on the road quite a bit lately because these days there is as much yapping and storytelling as there is playing,” says Potvin, “but I actually came up with the hook for that song at Doug Chappell’s house. His daughter and I were later married, but we were still dating at that time, and the Chappells were always super nice about having me stay at their house when I had some time off. “That particular evening I was tucked into my little hide-a-bed in Doug’s guest room,” he recalls with a laugh, “just flippin’ channels, and I came across an episode of Rhoda, which of course was a spinoff of The Mary Tyler Moore Show. When it came time for the Pikes to discuss new demos, Potvin was initially reluctant to share the song with his bandmates. Certified platinum in Canada, “She Ain’t Pretty” was a massive success. Nominated for 3 Juno Awards in 1991 (Group of The Year, Single of The Year, and Best Video), the song ultimately became the biggest hit of the Pikes’ career. Though the band announced an indefinite hiatus in 1993, they joined forces again before the decade’s end in 1999, and have continued to tour and release new music independently. In a big strokes kind of way, Potvin says the band is aware that they only have a certain amount of time left, but that while they “still sound good and all kind of look decent,” they plan to get out there and perform for their fans as much as they can.